Many people probably know KCR for the biannual Machine Gun Shoot and, now, from the TV show, but you’re open 6 days a week all year long for people to shop and shoot. What are some things that most people might not know about Knob Creek? Mainly, that we are closed on Tuesdays. HA!HA! All joking aside, people may not be aware that we offer CCDW classes on a regular basis and also host Hunter education classes in the spring and fall of the year. I’ve attended both of those classes! I’ve been shooting at KCR for a few years now, but the range is much older than that. How long has Knob Creek Gun Range been around? The range property was purchased by my grandfather, Biff Sumner Sr. in 1963. We’ve heard that this place has been a shooting range for a long time, being a military shooting range in the past. What is the history behind the KCR location? Originally the range was a naval proving ground and when they no longer needed to test the big naval guns here the property was auctioned… and thus Knob Creek Gun Range was born. 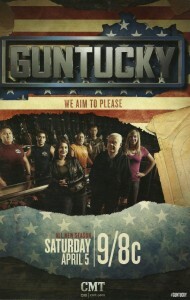 How do you like having your own television show now, Guntucky on CMT? It has its ups and downs. It’s neat to meet new people and mess with cool weapons. The main down is it’s very time consuming and demanding. When will the next season of the show be back on the air? 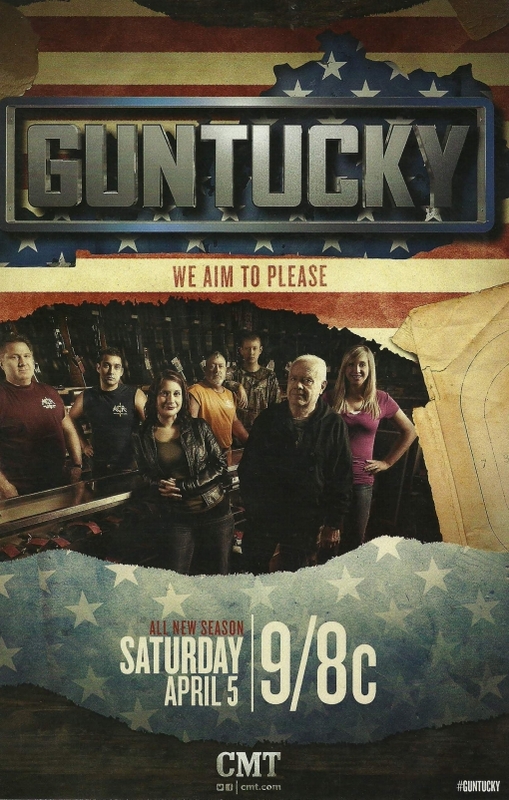 It starts April 5th at 9:00 pm eastern time on CMT and will be hour long episodes. Lots of guns, big explosions and the Sumner family just being ourselves. How long have you been putting on the Machine Gun Shoot? Biff Jr. started the shoots in early 1970. Aside from the big Machine Gun Shoots, Knob Creek is also home to competitions, Project Appleseed marksmanship clinics, CCW classes, hunter education and more. Tell us about some of the other events you have and how people can find out more about them. Through the summer months, we offer several night shoot events, where shooters can try their weapons out in the dark with lasers and flashlights attached. They get to shoot at special effects targets down range and are able to rent different firearms to shoot. How did you get involved with Project Appleseed? They approached us asking for a place to host their shooting events and we said SURE! Has KCR staff participated in any Projet Appleseed clinics? If so, did everyone earn their Rifleman patch? Not as of yet. I need my employees in the shop to work the weekends. Yeah, weekends at the range are definitely busy and probably requires “all hands on deck.” There has been a lot going on recently at KCR. A new bridge and some major changes to the store/range house. What else does the future hold for KCR? When we get moved into our new larger showroom, we plan on having gun safety classes for women, children and what the heck, even men. The firearms and ammo market has been shaken up for a while with some “panic buying” going on. From what you’ve seen, do you think that the panic is starting to go away, still getting worse or staying about the same? Panic buying has slowed on military style firearms, but with all the crime and violence in the news, folks are buying smaller concealable hand guns for personal and home protection. That makes sense; crime in nearby Louisville has been making news recently. You sell firearms as well as renting them for use on the range. Do you sell or rent machine guns and class III items? We do not sell machine guns as we are not a class three firearms dealer. However we do rent our personal machine guns at the summer night shooting events. That sounds like a lot of fun! Your crew really seems to like blowing stuff up. What is your favorite reactive target that you have had on the range? Everything that we blow up at the shoots is pretty cool. You get to see bits and pieces of flying debris going through the air, but the most awesome are the barrels of fuel. When they blow it fills the valley with big mushroom clouds and fire balls from HELL!! Yeah, we know all about the fireballs! It is definitely exciting to watch! What is your favorite part (or story) about running KCR? The 16 hour work days. Uh… yeah. 16 hour work days sounds like a lot of fun. GunLink has been covering the NSSF SHOTShow for the past couple of years. Does KCR send any staff to the show? Maybe we’ll run into each other. Biff Jr. (alias patch man) at the Shot Show is our representative there. It’s very possible you could see us there in the future. Oh, we’ve seen Biff Jr. walking around SHOT Show. I spotted him near the GLOCK booth by The Gunny in January. Anything else you’d like to add? Don’t forget to check us out on April 5th at 9pm on CMT and our spring Machine gun Shoot and Military Gun Show April 11- 13.